Join the discussion on our forums! Come discuss Barista Lynchen over in our dedicated Barista Lynchen discussion topic. Battlecry: Add a copy of each of your other Battlecry minions to your hand. "We've got a latte for... uh... Myjawsthatbite Myclawsthatcatch?" Uhh you forgot my 'snicker snacks'. You heard it here first folks... She works perfectly with Flobbidinous Floop. stupidly thought this card meant that you copied them in your hand..... Didn't realize it was only in play ones. Thought you could go infinate shudderwoks :( Any one have any cool recommendations? she did save me from a bomb warrior one game though because I had 9 cards and she clogged my hand with garbage so that I didnt draw any bombs lol. Dragon decks are always full with battlecries. Your minions on the board with Battlecry in their text get copied into your hand when you play this card. If you play Shudderwock on an empty board, it will not copy itself, nor will battlecry minions already in your hand get copied. 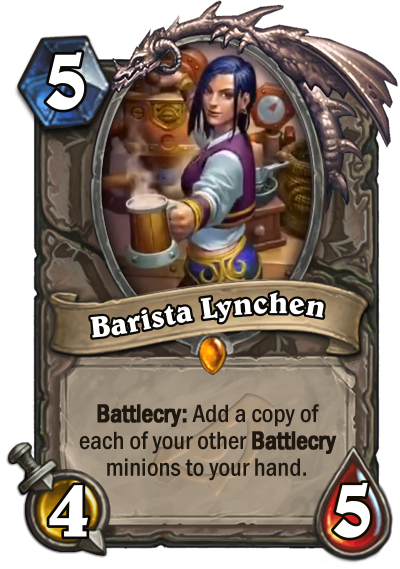 If that's true then that's an obvious intentional nerf, if Barista can't target herself (a dupe for example). Play: Double-pump Azerano, extra star-whip, Highmountain ice, room for mana spice comin' right up! Waiting for someone play like 7 of these at once just to hear this line stacked 7 times. I want an earrape version. Oh wait, the other cards have to be already in play? well damn, looks less impressive now. The best combo I see is to play War Master Voone on turn 4 and then copy him with this (or wait until turn 9 and play both). For the memes, you can copy Griftah just as well. One of my favourite cards! With shudderwokis pretty useless because it copies himself alone, but Reeno Jackson, C'Thun and all relative cards, al mininons like dragons and elementals that usualy have battlecry effect. So many interactions in many different mid range/control decks that should take a great advantage from this card, and in many cases it can be stronger than Zola the Gorgon because it directly interacts with cards in your hand. Shudderwock won’t copy this Battlecry and move itself to your hand. But it’s still an interesting card.